When Maple River Grain and Agronomy, LLC opened its rail terminal at Casselton, ND for business in 2004, the facility had a single truck scale for both inbound and outbound trucks. It rapidly became a bottleneck. “During the height of harvest, we’ve had as many as 379 trucks dumping in a 12-hour period,” says Scott Althoff, grain operations manager. 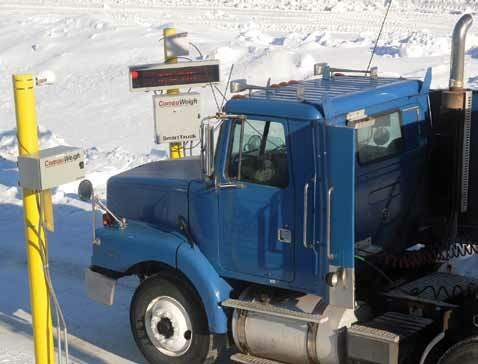 Among the improvements made to the terminal in a general upgrade in 2010, Maple River added a second truck scale for outbound tare weights and a SmartTruckTM scale management system from CompuWeigh Corp., Woodbury, CT (203-262-9400). 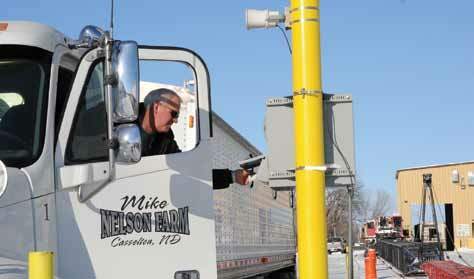 Truckers hauling grain to Maple River are issued a special RFID tag, which they place inside the windshield. The tag contains a unique identification number. As the truck approaches the probe station, an RF antenna scans this number from the RF tag and transmits it to a CompuWeigh GMS workstation, which then pulls up a list of recent transactions hauled by this truck. with the unique RF tag at each subsequent station, without human intervention. The data also appears on a CompuWeigh SmartView LED message board at the probe station, so the driver can verify the information. using a SmartView message board at the inbound scale. without having to leave his cab. 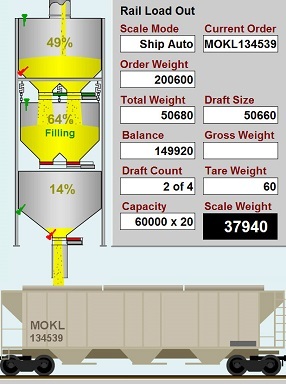 After unloading grain at the appropriate pit, the driver proceeds to the outbound scale. Again, antenna reads the RF tag, photo eyes confirm that the truck is entirely on the scale, and the system associates the tare weight with the correct transaction. intercom, so the driver can communicate with the scale operator, if necessary. Althoff says the SmartTruck system interfaces with the facility’s Agvance grain accounting system to provide data allowing the company to proceed with settlement. He adds that the new SmartTruck system helps truckers move through the elevator within an average of three minutes after probing, compared to five or six minutes before the new system was installed.